The Union Hill Civic Association recently provided us with a recap of their quarterly meeting. Check out the notes here! Carla gave an update about the July 1st Union Hill block party. Donations have been secured and most of the planning is under control. The committee requests help spreading the word, and for attendees to bring a dish to pass or a lawn game to share. We got a $500,000 line in the budget to start work on Jefferson Avenue! Michael Sawyer is the Traffic Department head and will serve as our liaison, and Councilwoman Newbille will be looking for a followup meeting with us in August. Legislative update has been postponed until our September 5th meeting. Sarah Krumbein announced her upcoming proposal to CAR for some type of fence to enclose the lot next to Tricycle Gardens. Concerned parties encouraged to attend the July 24 CAR meeting. Sonny Hughey and Sean Pyle from New Visions Civic League updated us on improvement plans to Carrington Street, and asked for a letter expressing Union Hill’s support of their endeavor. A motion was made and approved, with amendments that they follow the pedestrian-friendly guidelines. Click here for a draft of the support letter, and please reply to this email if you have any additions or concerns. Through September 1st the dump at 3800 East Richmond Road will be open Saturdays from eight until noon. Bulk collections will continue to be picked up on the same week as recycling, just make sure you have your bulk item out next to your super can Thursday morning. The city is working on eliminating illegal dumping sites; if you know of one in the 7th district please email our Clean City Commissioner Nancy at maarn95@comcast.net and she’ll get it on the map. Rachel Pater gave update about Union Hill flag subcommittee, which should have some flag options up for vote at the July picnic or September meeting. Lt. Roane presented a sector update the theme of which would be lock your cars. Thefts from vehicles and vehicle thefts are up city wide, so hit the lock button twice. Detailed crime statistics for sector 111 can be found here. Thanks for the update! Can you confirm the date of the community garden work day (June 17 has passed..). Also, what is the proposed work for Jefferson Avenue? 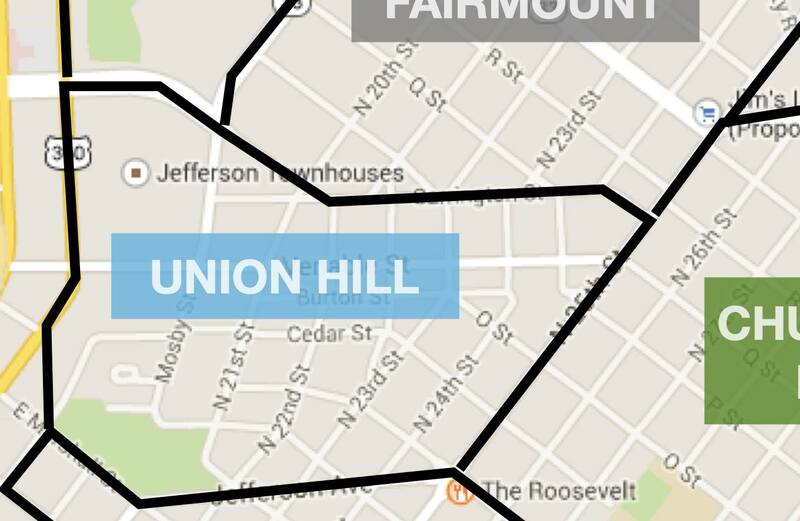 Union Hill has been really crushing some initiatives recently. There are a lot of people that work really hard behind the scenes for no money to advocate for this neighborhood. You guys are appreciated. The work on Jefferson Ave. will be determined through a planning process that includes a design consultant, DPW staff and community input. There will be a community meeting in August after which the project schedule will be set.